LOLL in one of the pools at Pelican Eyes, a new development above the town of San Juan del Sur, on Nicaragua’s Pacific Coast: a tranquil breeze blows up the hillside from the perfect bay below, the pool’s disappearing edge merges with sea and sky, and the only sound is the rhythmic tapping of the bricklayers who are building the place — a compound of whitewashed, tile-roofed houses amid lush greenery and looking out to perfect sunset views. At the bottom is an airy palm-thatched restaurant, where cheerful waiters serve strong drinks and the patrons sit in the warm night air and talk about real estate. This is Nicaragua as the Next Costa Rica, the sort of hopeful real estate appellation signaling that gentrification may now begin in earnest. In the last few years, as Americans on the prowl for second homes, or just an investment, have found places like the Last Costa Rica already overrun by their own kind, a boom has started in the country just to its north. 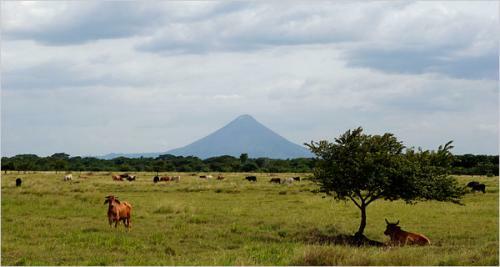 Nicaragua is no stranger to American visitors with grandiose plans. That perfect bay at San Juan del Sur was the place Forty-Niners on their way to California from New England embarked upon the Pacific after a journey across Nicaragua. William Walker, a freelance American colonialist, made landfall here in 1855 to undertake a bloody, tragicomic campaign to introduce democracy, railroads and slavery. Before facing a firing squad, Walker was briefly the president of Nicaragua, an episode that, perhaps even more than the quarter-century occupation by the United States Marines at the start of the 20th century, and even the Contra war of the 1980s, informs a Nicaraguan wariness of American enthusiasms. So for now, this is still Nicaragua. If you descend the hill from Pelican Eyes and pass its guardhouse at the foot of the drive, the road is pocked and broken. Shanties cluster at its side. Yet toward the water, San Juan del Sur retains an attractive character. It’s a mellow seaside town where blond surfers stroll obliviously past a Sandinista rally, with loudspeakers blaring revolutionary songs. This town of brightly painted wooden houses with red metal roofs is fronted by a wide, pretty beach. At the open-air restaurants there, you can relax with a setup that includes a bottle of fine, clean Flor de Caña rum, a bucket of ice, a few bottles of Coke and a dish of limes. You can walk out for a dip in the warm, shallow water from time to time, then return to the restaurant and snack on salty fried cheese and sweet maduros (fried ripe bananas) as you watch kids play soccer on the beach. Boats bob just behind the soft, curling surf. I visited in August, with the photographer Morgan Stetler and his fiancée, Anne-Lise Reusswig. In preparation for the elections that took place at the beginning of November, all around us were the workings of the democracy that has emerged from Nicaragua’s troubled past. This was the fourth consecutive free election in the 16 years of peace since the end of the Marxist regime of Daniel Ortega. The Sandinistas won, making Mr. Ortega, their longtime leader, president once again. But he is president of a different Nicaragua, and there seems little chance that the Sandinista victory will lead back to the chaos of the past. The news in August was of campaigns, scandal and, more pertinent to the visitor, the rolling blackouts born of high oil prices and botched energy privatization. “No hay luz” — “There is no light” — was an apologetic refrain we heard throughout the country, and we found that a generator had become the most important hotel amenity. In Granada, we stayed at the newly remodeled Gran Francia. Besides being a well-lighted beacon in the darkened city, it was comfortable and well placed, on the corner of the central plaza, right next to the freshly painted mustard yellow cathedral. In the plaza, the city’s annual weeklong festival for its patron saint, the Virgin of the Assumption, was in full swing. It featured a cacophony of school drum corps, church bells and booming fireworks at seemingly random times (like just before dawn). The afternoon we arrived, an endearingly bad mariachi band played sad songs of lost loves as the singer hobbled about the plaza’s band shell with one leg drastically shorter than the other. Vendors sold wooden toys and fire-roasted cashews around the plaza, and a breeze brought the sweet smell of the countryside into the city. GREGORY DICUM is the author of “’Window Seat Europe,” about reading the landscape from 35,000 feet in the air, published by Chronicle Books. An article on Dec. 17 about the emergence of tourism in Nicaragua provided an incorrect phone number for a guide in León who leads volcano treks. The number for the guide, Mario Munguia, who is a member of Las Pilas-El Hoyo Rural Tourism Cooperative, is 505-6967-381.